Many fans were surprised to find out that American Family Insurance bought the naming rights to Miller Park. 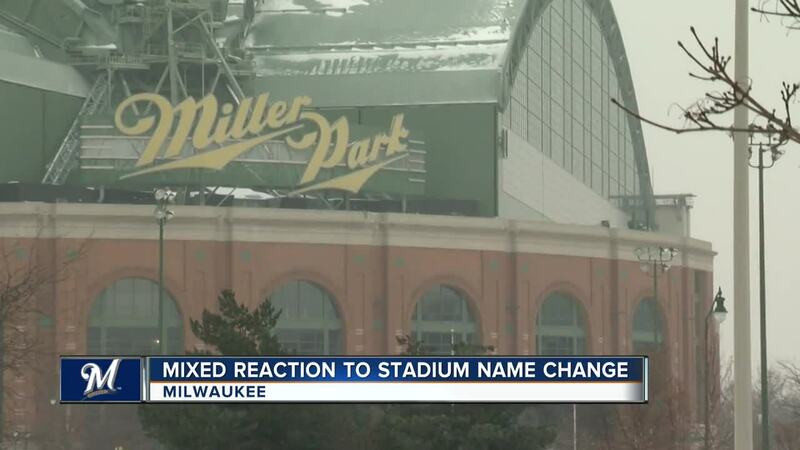 MILWAUKEE — Many Brewers fans said a name change to Miller Park doesn’t mean they have to go along with it. “I can’t imagine this being anything else but Miller Park,” said Nikki Wachowiak, Caledonia. “It’s just kind of weird that you can just take that away from a great fan base that the Brewers have,” Tony Harris, Seattle. Some fans were caught off guard. “My first reaction was like 'Whaaat'. I was kind of disappointed I guess in the name change. It always will be Miller Park and that’s how I’ll always look at it,” said Sue Brand, Glendale. “I’m really surprised. I mean Miller Park has been an icon a staple of Milwaukee and to change the name,” said Teri Lenske, Pewaukee. Even though the Brewers didn’t announce the stadium’s new name, American Family Insurance will officially take over naming rights in 2021. “It just seems like Miller Park fits it better than American Family,” said Sue Brand, Glendale. “Just doesn’t sound right. Doesn’t have the same ring to it,” said Brian Oppliger, Seattle. “I’m real excited. American Family, good company. I’m a wine drinker not a beer drinker so hopefully American Family can sponsor a good winery here too,” said Paul Myles, Whitefish Bay. Katie Smith said she still calls Miller Park County Stadium. “New team, new name, let it roll as long as they play ball,” said Katie Smith, Ixonia. Others admit it won’t be easy to let Miller Park go. “It’s gonna be sad when it’s changed to the new name it won’t be the same,” said Tony Harris, Seattle. Fans started circulating an online petition protesting the name change Tuesday morning.